With many delightful courses, pure coastal breeze from the Atlantic ocean, great fresh gastronomy and fantastic weather conditions, the Madeira is a Golf Bliss for most golfers. 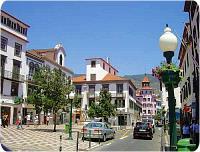 Madeira is formed by two main Islands, Madeira and Porto Santo. 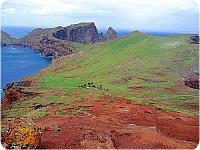 The main island, Madeira, is 56 Kms. long and 19 Kms. wide but it would take a day to drive around the island due to its volcanic peaks that soar up to 1.862 metres, then in places dropping sharply into the ocean and down another 1.000 metres to the seabed. 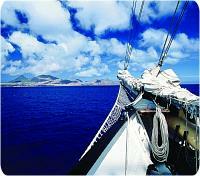 This island in the Atlantic Ocean has a land area of about 797 square kilometres, and about 600 Kms. away from the coast of Morocco. The Islands were known about by earlier sailors than the original settlement of people which took place in the early 15th Century led by the Portuguese explorer João Gonçalves Zarco. Sugar cane was grown and by 1514 there were already some 5.000 permanent inhabitants. It became a fought over prize for both the French and the Spanish. 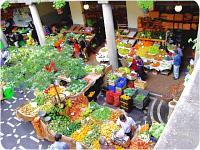 The French sacked Funchal in 1566 and it was not until 1662 when the Portuguese regained permanent control. In 1801 An English fleet arrived and temporary took Funchal by ousting the Spanish and French defending forces. This action was repeated by the English in 1807 and again returned it to Portuguese control. There is a romantic story which records that the ship carrying the famous pirate William Kidd and his immense treasure, sank in a location close to the Deserted Islands. By 1890s the island had attracted tourists and many English residents and has since continued as a very popular location due to the temperate climate of never being too hot nor too cold. Today, the total resident population slightly exceeds 100,000. 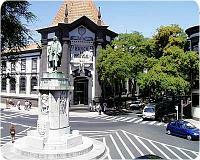 The town and port of Funchal is the main town of the Ilha de Madeira. The port is architecturally pleasing with the added attraction of its decorative paved streets. Visitors to the island are usually smitten by the impressive rugged beauty of its peaks in comparison to the lush semi-tropical vegetation around its coastline. The 15th Century Convento de Santa Clara is well worth a visit and to also learn the tragic story of the nun, Maria Clementina. The 17th Century church Igreja do Colégio dominates the main square. There are several museums worth visiting, from sacred art to local handcrafts. The quality of the Madeira Lace is world known and it continues to be produced with over 20.000 cottage industry workers scattered over the island. Another equally famous product is the Madeira wine. A visit to the Adegas de São Franciso to learn how it is made and stored as the oldest bottles still existing dates from 1772! The hidden valleys and peaks of the Island all deserve a visit together as do the several botanical gardens, some of which are part of old private residencies opened to the public. A trip around the island has to to take in the village of Santana on the north coast where the visitor will still see the traditional triangular shaped homes of the islanders. 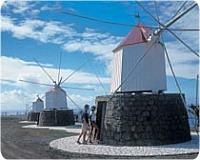 For the healthy at heart is a trip to Pico do Areeiro and climb to the highest point on the island at 1.862 metres. For fun there is the special and unusual dry toboggan ride on the Monte in the main town. Most visitors find too much to do on the island, and too little time! 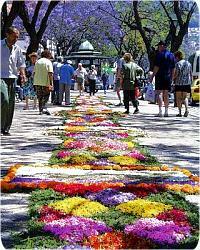 A very special time to visit Funchal is over the New Year’s Eve which is world famous for the quality of its celebration. About two hours by boat will take you to the island of Porto Santo that has what the main island lacks – a sandy beach of 9 Kms. in length. Here, there is museum to Christopher Columbus who is said to have lived on the island after marrying the daughter of the first governor. Porto Santo has become very popular as a holiday destination in the last five years and Hotels and Resorts have stolen the peaceful beauty of the Island. 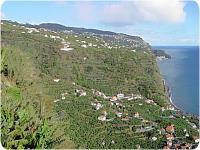 Most world travellers find the Madeira Islands so attractive and interesting that they tend to return more than once. There are so many lovely interesting sandy beaches in the Madeira that you will find amongst them a good selection on which to enjoy your holiday. Everyone has their favourites and these are often hidden away from the more popular ones! When you see the sign “Praia” this means in Portuguese “beach”.